NEW YORK — Dennis Quaid brings his formidable talent to bear in the faith-driven drama “I Can Only Imagine” (Lionsgate). His portrayal of Arthur Millard, the abusive father whose conversion to evangelical Christianity inspired his son, Bart (John Michael Finley), to write the eponymous 2001 song — an unprecedented chart topper that became popular even with nonbelievers — represents the film’s principal asset. A washed-up high school football star whose gridiron career went nowhere, the elder Millard never loses an opportunity to throw cold water on Bart’s childhood dreams and nascent creativity. And his mistreatment of the lad involves wielding a belt as well as cruel words, though this is implied and discussed rather than seen. Yet, as Quaid succeeds in conveying, Arthur also is the victim of his own painful frustrations and sense of failure. His eventual repentance, moreover, is shown to be appropriately hard-won. Directors and brothers Jon and Andrew Erwin’s movie is essentially a biography of Bart, the front man for the group MercyMe. Besides his turbulent relationship with his dad, the script, which Jon Erwin co-wrote with Brent McCorkle, also traces amiable Bart’s on-again, off-again romance with Shannon (Madeline Carroll), his childhood sweetheart. And it chronicles his struggle to achieve musical success under the guidance of his group’s dedicated manager, Scott Brickell (Trace Adkins). As its advertising tagline “The song you know. 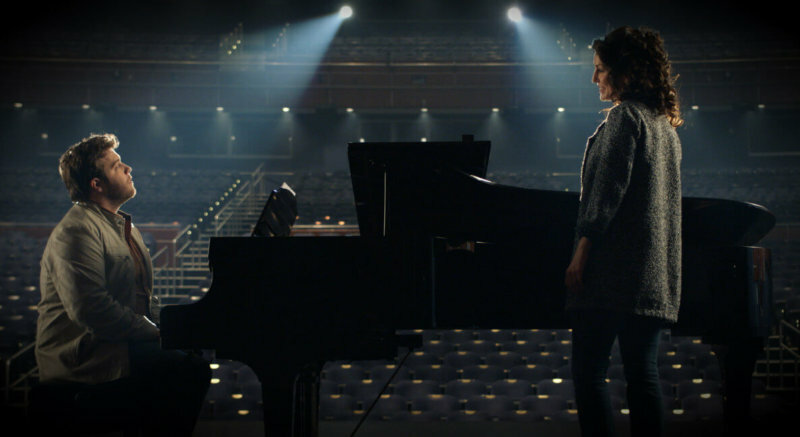 The story you don’t,” suggests the prime audience for “I Can Only Imagine” will be religious pop fans who, like Bart, would be star-struck on meeting genre icons Amy Grant (Nicole DuPort) and Michael W. Smith (Jake B. Miller). Indeed, the lead-up to the scene of the title song’s premiere performance seems calculated to tantalize those especially devoted to it. Still, with an inspiring real-life story to tell, and a screenplay free of anything at all offensive, the picture offers uplifting entertainment that parents and teens can share without worry. The film contains mature themes, including marital discord and the physical abuse of a child. The Catholic News Service classification is A-II — adults and adolescents. The Motion Picture Association of America rating is PG — parental guidance suggested. Some material may not be suitable for children.